The Orange County Register reports that the City of Huntington Beach will pay approximately $70,000 to settle a library clerk’s lawsuit against the city for wrongful termination. A consultation with an experienced Costa Mesa wrongful termination lawyer could be the first step in filing an employment lawsuit. At NASSIRI LAW, we will take a careful look at your situation and aggressively pursue potential claims to assist you in making the fullest recovery. The report stated that the library clerk, who has cerebral palsy and is deaf, allegedly yelled, made inappropriate hand gestures to, and threw a book. In the state of California it is illegal to terminate an employee if the termination is a violation of the fundamental public policy of California. This means that an employer is not allowed to discipline or fire you for the wrong reasons. If you have been wrongfully terminated there is potential to recover for your emotional distress as well as your financial losses. When the library clerk filed her complaint late in 2011 the city responded with over 25 reasons why it was not responsible for the woman’s firing. The library clerk’s lawsuit claimed that library management failed to accommodate her for her disabilities and she was terminated after she complained about the decrease in accommodations. Although library clerk was accused of throwing a book there was no record of the incident in her employee file. Research indicates that it is extraordinarily common for employers to underestimate the communication skills of deaf employees. Typically deaf employee’s are underestimated out of both fear and misunderstanding of the disability. 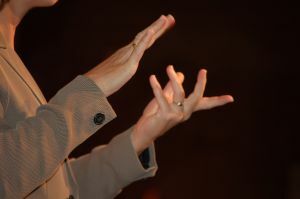 The solution to the fear and misunderstanding of deaf employees can be cured by more effective education of coworkers. Often employers believe that accommodating an employee who is deaf will be costly. This belief is maintained because employers have not explored the benefits offered by the deaf community to assist in providing accommodations for deaf employees at little or zero cost. Communication with deaf employees can be different than communicating with individuals who can hear but there are simple rules of etiquette that can make communication far more effective. Using a light touch, small wave, or eye contact can be an effective way to get a deaf co-workers attention. Using hand gestures and pointing at specific items can really make communication far easier with a deaf coworker. Lastly, visual aids such as written agendas and powerpoint presentations can assist in providing a deaf employee with more information.